Although the blockchain technology may have been built with Bitcoin in mind, more companies realize the true value of this technology and have started to incorporate it with the products they offer. In fact, large companies from various sectors like banking and telecommunications have already expressed their interests in tapping the blockchain technology to innovate and improve their services. The growing curiosity over the Bitcoin blockchain is unstoppable, and it is not surprising to see it being utilized more emphatically in the iGaming industry. While the Bitcoin gambling niche slowly establishes itself to provide online and mobile Bitcoin casino alternatives, other gaming sectors were quick to adapt to the technology as eSports freely welcomed the cryptocurrency, which is evident in the rise of other Bitcoin games and eSports sites like Leet and VitalBet, among others. 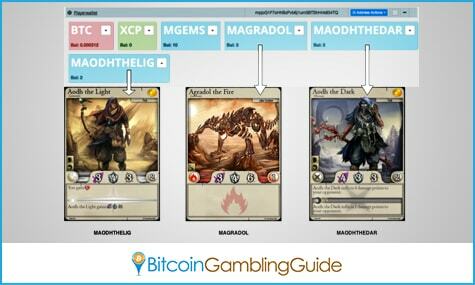 Now, the Bitcoin blockchain technology finds itself useful in mobile gaming with Spells of Genesis becoming the first blockchain-based trading card game. Spells of Genesis is the upcoming game from the Swiss-based game company EverdreamSoft, and is a follow-up to Moonga, the popular trading card game released in 2010 for iOS and Android devices with more than 250,000 downloads. EverdreamSoft fuses its games with the Bitcoin blockchain by using the Counterparty protocol, which enables each trade to function as a Bitcoin transaction. The company believes doing so will bring its games a notch higher and more revolutionary in supporting and promoting innovative technologies. With the game on board the Counterparty platform, players can trade cards and game items even outside the mobile game app. Likewise, BitCrystals, which can be used for creating new card packs or for trading with fellow players, also count as Counterparty assets. 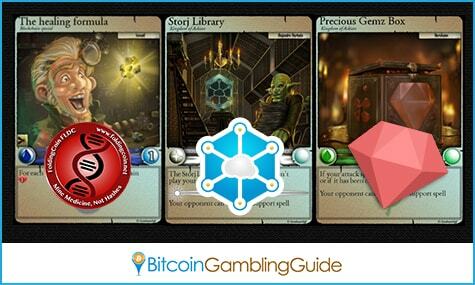 Spells of Genesis is not limited to the promotion of the Bitcoin blockchain technology. It also advocates for the support of the new projects in the cryptocurrency space. By adding limited edition trading cards on the Counterwallet, the game manages to incorporate selected altcoins like FoldingCoin, Storjcoin, and Gemz. For instance, the FDCARD, which bears the names ‘The Healing Formula’ only has 300 units available in total and can only be purchased using the FoldingCoin. This altcoin’s main purpose is to aid scientists in finding cures for diseases. Moreover, Storjcoin must be used to buy the SJXCCARD or the ‘Storj Library’ card while GetGem’s currency Gemz is needed for the ‘Precious Gemz Box’ card. According to reports, more Bitcoin 2.0 projects will be included in this mobile blockchain-based trading card game, staying true to its purpose of further promoting both the blockchain technology and the promising Bitcoin 2.0 projects on the market today.